State’s rental rates lead U.S.
Hawaii renters and homeowners face some of the highest costs in the country, according to annual economic, housing and social data released this week by the U.S. Census Bureau. Hawaii renters paid $1,116 per month on housing costs last year, the highest median amount in the country. The median means half of the renters paid less and half paid more. Californians paid the second highest at $1,029, and New Jersey renters paid $974, the third highest. North Dakota renters paid $497 per month, the least amount among all 50 states in the country and the District of Columbia. The national average was $763 per month. The housing costs for renters is one of more than 1,200 American Community Survey data tables released Wednesday. Many of the tables can be found at the U.S. Census Bureau's Web site at www.census.gov. 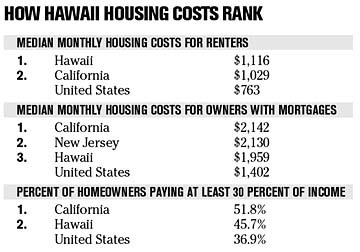 For nonrenters the median amount Hawaii owner-occupants with mortgages paid every month in housing costs last year was $1,959, the third highest in the country. Only California and New Jersey were higher with $2,142 and 2,130, respectively, according to the Census data. The high rents and mortgages meant 45.7 percent of both owner-occupants and renters spent 30 percent or more of their household incomes on housing. Fourteen other states had a higher percentage of renters who paid at least 30 percent of their incomes for housing and utilities. But only California had a higher percentage of owners paying 30 percent or more for housing than Hawaii. Those Hawaii owner-occupants were paying off mortgages on homes with a median value of $529,700 last year. Only California had a higher median at $535,700. The national average was $185,200. Mississippi had the lowest at $88,600. Hawaii had the fourth-lowest percentage of owner-occupied housing units last year at 59.5 percent. Only California, New York and the District of Columbia were lower. The national average was 67.3 percent. Minnesota had the highest owner-occupied housing units with 76.3 percent. Housing was not the only category in which the islands were either at the top or bottom of the rankings. Hawaii had the second-highest portion of working people employed in service occupations and fifth-highest percentage of civilian employees working for the government. Hawaii also had the second-highest percentage of households with one or more people 65 years or older, the third-highest percentage of households with retirement incomes but the lowest percentage of grandparents responsible for their grandchildren. » State's rental rates lead U.S.